Kamara carried the ball 13 times for 45 yards and a touchdown, adding seven receptions (eight targets) for 31 yards and another score in Sunday's 30-20 win over Minnesota. Kamara rushed for 64 yards on 17 carries and added 11 yards on two catches during Sunday's 24-23 win over Baltimore. Coach Sean Payton indicated that he's hoping to keep the Saints' backfield touches between Kamara and Mark Ingram more balanced in future weeks, Nick Underhill of The New Orleans Advocate reports. Kamara rushed six times for 24 yards and caught three of four targets for 15 yards in Monday night's 43-19 win over the Redskins. Kamara (knee) is absent from the injury report ahead of Monday's game against the Redskins, Josh Katzenstein of The New Orleans Times-Picayune reports. Analysis: Kamara's practice reps were restricted throughout the week, but it turns out the Saints were just exercising caution with their stud back. They did the same thing prior to last week's game, so it could become a recurring theme as the season progresses. Still, the return of Mark Ingram from a four-game suspension could finally slow down his hot start to the season a tad, but it is not expected to significantly impact Kamara's standing as a must-play option each week. Kamara (knee) was a limited participant in Friday's practice. Kamara was limited in practice Thursday due to a knee injury, Josh Katzenstein of The New Orleans Times-Picayune reports. 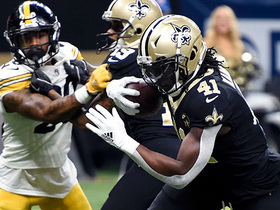 Analysis: Despite following an LP/DNP/LP practice regimen last week, Kamara didn't have a designation for Sunday's eventual win against the Giants, who he ripped up for 181 yards from scrimmage and three touchdowns on 24 touches. Assuming he goes down a similar track this week, he'll be welcoming back Mark Ingram from a four-game suspension Monday versus the Redskins. Consequently, Kamara should experience a reduction in his 22.8 touches per game with Ingram back in the fold. Kamara rushed for 134 yards and three touchdowns on 19 carries while catching five of nine targets for 47 yards in Sunday's 33-18 win over the Giants. 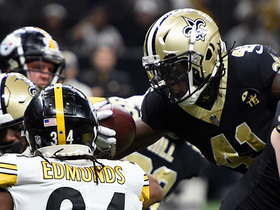 Analysis: Kamara carried New Orleans' offense on a rare off day from Drew Brees, scampering into the end zone from distances of nine, four and 49 yards. He's now racked up five rushing touchdowns this season to go with one receiving score. 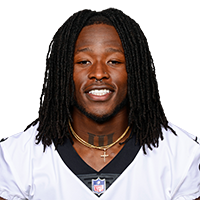 Even with Mark Ingram due back from his suspension Week 5, Kamara should still be a major force as both a runner and receiver against the Redskins on Monday Night Football. Kamara (knee) was a limited practice participant Friday but doesn't have any designation on the final injury report for Sunday's game against the Giants, Joel Erickson of The New Orleans Advocate reports. Analysis: The Saints managed Kamara's workload during practice this week, having him sandwich two limited sessions around Thursday's full participation. He should be fine for another enormous workload after handling 16 carries and 15 receptions in a Week 3 overtime victory over the Falcons. Kamara (knee) practiced in full Thursday, Adam Caplan of SiriusXM Radio reports. Analysis: Kamara made a surprise appearance on Wednesday's injury report, practicing in a limited capacity due to a knee concern. The issue appears to be minor, though, after managing every practice rep Thursday. He'll thus set his sights Sunday on a Giants defense that has allowed 125.3 yards from scrimmage per game and four touchdowns to running backs this season. Kamara was limited at Wednesday's practice due to a knee injury, Luke Johnson of The New Orleans Times-Picayune reports. Kamara rushed 16 times for 66 yards and caught 15 of 20 targets for 124 yards in Sunday's 43-37 overtime win over the Falcons. 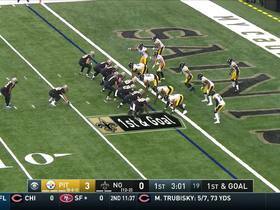 Analysis: Kamara could've had an even bigger day, but he had two short touchdowns vultured on the ground by quarterback Drew Brees, including a one-yard score in overtime after a would-be Kamara touchdown was ruled just short. Still, it's tough for owners to complain about this effort, especially in PPR formats. The second-year running back has a whopping 430 scrimmage yards through three games heading into next week's road tilt against the Giants. Kamara rushed 13 times for 46 yards and brought in all six of his targets for an additional 53 yards in the Saints' 21-18 win over the Browns on Sunday. He also logged a two-point conversion rush. Kamara played 52 of 64 snaps (81.3 percent) on offense in Sunday's 48-40 loss to Tampa Bay. Kamara rushed eight times for 29 yards and two touchdowns and brought in nine of 12 targets for 112 yards and another score in the Saints' 48-40 loss to the Buccaneers on Sunday. 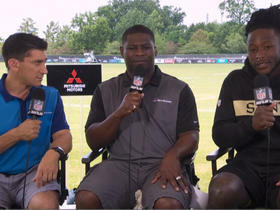 Saints coach Sean Payton told Fox's Jay Glazer that they want to be careful not to overuse Kamara during teammate Mark Ingram's suspension, Glazer reported on Fox's pregame show. 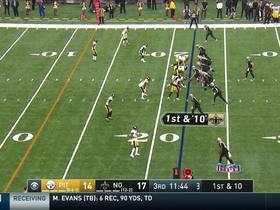 Analysis: This follows with how Kamara was used last season, particularly in the running game. That could mean that we'll see a lot of Mike Gillislee, particularly between the tackles. The Saints also activated Jonathan Williams from the practice squad for this week. Kamara rushed four times for 16 yards and one touchdown during Saturday's preseason game against the Chargers. He also caught one of two targets for 10 yards. Kamara isn't playing in Friday's preseason game against the Cardinals, Herbie Teope of NFL.com reports. 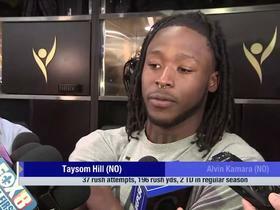 Saints head coach Sean Payton and running backs coach Joel Thomas both said they don't want to drastically increase Kamara's workload while Mark Ingram is suspended for the first four games of the season, NFL.com's Herbie Teope reports. "I think it would be a disservice to him," Thomas said. 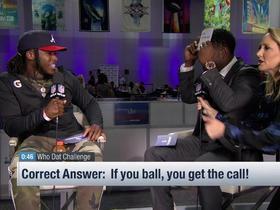 "Let's be honest here -- he's excelled with the ratio he's had, whether it's the carries or the combination with the catches, as well. It's almost a number that you want to get to that he's still getting the touches that he's had in the past. But maybe they occur through two, three or four more carries, and two or three less receptions." Kamara should lead the Saints' backfield to begin the season following a report by Ian Rapoport of NFL Network indicating Mark Ingram has been suspended for four weeks. Analysis: Kamara averaged only 7.5 carries per game during his rookie campaign, but that may increase substantially early in the 2018 season with Ingram out of the picture. Coach Sean Payton generally prefers to split the backfield duties, so it won't be surprising if Trey Edmunds, Boston Scott, Jonathan Williams or Daniel Lasco (neck) sees a jump in snaps as well. With Ingram's contract expiring after 2018, we may get an early glimpse at the future of the Saints' backfield. Kamara rushed 11 times for 43 yards while catching four of seven targets for 62 yards and one touchdown during Sunday's 29-24 NFC divisional-round loss to the Vikings. Kamara finished with 10 rushes for 23 yards and a touchdown, and caught one of three targets for 10 yards in Sunday's 31-26 NFC wild-card win over the Panthers. Analysis: Kamara was bottled up by Carolina's stout defense, accounting for the lowest yardage of any game he completed this season. Although the rookie's playoff debut didn't go according to script, he still managed to make a significant impact via a two-yard touchdown during the fourth quarter. That score ultimately proved to be the difference in Sunday's tilt, allowing the Saints to advance to the divisional round next weekend, when they'll travel to play the Vikings. Kamara rushed nine times for 44 yards and a touchdown, brought in six of seven targets for 84 yards and netted 155 yards and a touchdown on four kickoff returns in Sunday's 31-24 loss to the Buccaneers. Kamara carried 12 times for 32 yards and caught seven of nine targets for an additional 58 yards during Sunday's 23-13 loss to the Falcons. Analysis: Kamara managed just 2.7 yards per carry on the ground, but he was the most targeted Saints player on the day and padded his yardage total with some nice gains through the air. The rookie has now gone for at least 76 scrimmage yards in each of the last 12 games he's finished, and his effectiveness as a receiver has made him a top-notch fantasy asset in all formats. He'll look to put an exclamation mark on what has been a remarkable rookie season in Week 17 against the Buccaneers. Kamara ran for 44 yards on 12 carries and added 45 yards and a touchdown on six catches during Sunday's 31-19 win over the Jets. Kamara (concussion) has been cleared to play Sunday against the Jets, Mike Triplett of ESPN.com reports. Coach Sean Payton said Thursday that the expectation is for Kamara (concussion) to play Sunday against the Jets. Analysis: The running back already cleared a major hurdle by logging a full practice Wednesday, but concrete news with reference to Kamara clearing the NFL's concussion protocol has yet to arrive. That said, Payton seems quite confident that Kamara will gain clearance, but fantasy players should stay tuned for an official announcement before deploying the back in Week 15 lineups. Kamara (concussion) practiced fully Wednesday, Josh Katzenstein of The New Orleans Times-Picayune reports. 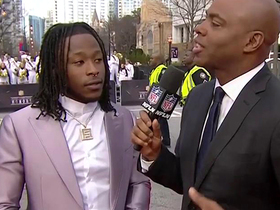 Analysis: After suffering a concussion last Thursday in Atlanta, Kamara first tweeted and then outright stated he wouldn't miss any time, per Katzenstein. An uninhibited session Wednesday is a step in the right direction, but such a development doesn't mean Kamara has emerged from the protocol for head injuries. Until he gains clearance from an independent neurologist, he won't be allowed to suit up Sunday versus the Jets. That said, Kamara has plenty of time to pass this final hurdle. 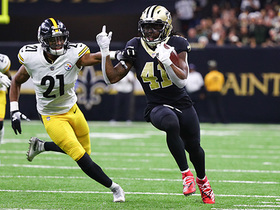 Kamara (concussion) said Monday that he expects to return for Sunday's game against the Jets, Josh Katzenstein of The New Orleans Times-Picayune reports. Kamara (concussion) indicated on his personal Twitter account that he hopes to play Week 15 against the Jets. Analysis: Kamara, who only played briefly in Thursday's 20-17 loss to the Falcons due to a concussion he suffered on the first drive of the contest, posted that he will be "right back at it next week." The running back's chances of playing in Week 15 get a boost by the fact the Saints played Thursday this week, affording Kamara a few extra days to gain clearance in the league's concussion protocol in advance of the Nov. 17 tilt. Kamara (concussion) has been ruled out for the remainder of Thursday's contest against the Falcons, Josh Katzenstein of The Times-Picayune reports. Analysis: Kamara will spend the rest of the night on the sidelines after suffering a concussion on the Saints' first possession of the game. Mark Ingram will handle the workload for the remainder of the contest, with Trey Edmunds serving as the only other active running back on the roster. Kamara will now enter league's concussion protocol testing, which he will need to pass before he can take the field again. Look for more updates on the rookie's status to come next week when the Saints resume practice. Kamara suffered a head injury during the Saints' first offensive drive Thursday night and is now being tested for a concussion, making him questionable to return, Ian Rapoport of NFL Network reports. Analysis: A brutal start for the Saints and their rookie phenom, who is now in danger of being sidelined for the remainder of Thursday's pivotal division matchup. 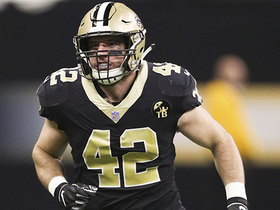 If he is ruled out, the Saints will have to rely on Mark Ingram to carry the load in the backfield, with Trey Edmunds also potentially seeing increased offensive reps.
Kamara had nine carries for 60 yards and two touchdowns and caught five of six targets for 66 yards in Sunday's 31-21 win over the Panthers. Analysis: Offering a rare combination of talent and team context, Kamara is somehow maintaining an unprecedented level of per-touch production, consistently performing as one of the elites at his position without ever approaching 20 touches. He's actually fallen between 10 and 17 in nine straight games, including an ongoing six-game streak with at least one touchdown. Kamara and Mark Ingram will both have a good chance to stay hot when the Saints face the Falcons in Atlanta on Thursday. Kamara rushed five times for 87 yards and one touchdown while securing all six of his targets for 101 yards and another touchdown during Sunday's 26-20 loss to the Rams. Kamara rushed eight times for 42 yards and caught six of nine targets for 74 yards and a touchdown in Sunday's 34-31 overtime win against Washington. He also ran in a successful two-point conversion. Kamara carried 12 times for 106 yards and a touchdown during Sunday's 47-10 win over the Bills. He also caught all five of his targets for 32 yards. Kamara rushed 10 times for 68 yards and a touchdown and hauled in six of seven targets for 84 yards and another score in Sunday's 30-10 win over the Buccaneers. He also lost a fumble.